Doesn’t this sound a lot better than “break-up”? Alaskans all know that this is not the prettiest time of the year. Here in Fairbanks, the snow is covered with sand, dirt, and coal ash from our five coal fired plants in the area. 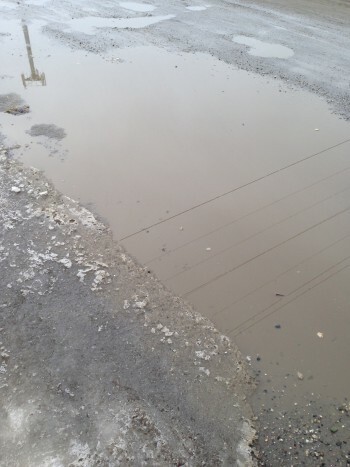 Large puddles splash up as cars slow to ease the mud that covers the windows and dirties the vehicle even more than the accumulation over the past few months. Others roar through the puddles without consideration of the consequences and surprise unsuspecting pedestrians. Yet it is filled with hope, as the days rapidly grow longer, the greenhouses are putting out plugs and plants, and the snow recedes–this year, at a very rapid rate of speed! The box stores all carry seed packets for those industrious enough to get a head start on the short growing season. Blogs, posts and emails are shared with the latest “how-to’s” of indoor gardening. Already we’ve been able to wash those south facing windows to let the sun shine in. All the energy that light brings is evident, as even the most pessimistic comments on how nice it is outside. I went for my first trip to the greenhouse to pick up some plant for my baskets. Usually I don’t have any baskets out until May. Yes, I am gambling; but it just feels safe. ( I can take the baskets in if we do get a sudden cold snap) Any excuse to be outdoors; let me walk the dog, patrol the parking lot, pick up the mail at the end of the driveway. It’s just too pretty to be inside. We, (again) broke high temperature records last week with a high of 52 degrees. 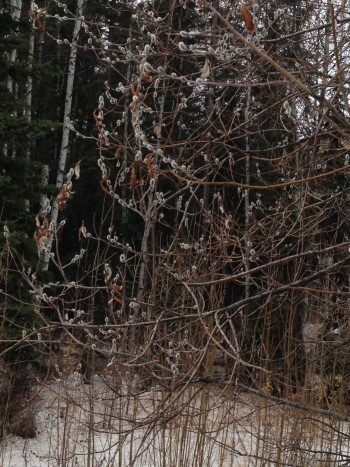 Believe it or not, that is amazing for the end of March in Fairbanks.